New Delhi: The Supreme Court on Tuesday supported the idea of having a law to put a ceiling on the lawyers’ fee, which is a barrier to access to justice and deprives poor litigants of suitable representation in courts. Citing the ‘astronomical’ fee being charged by top lawyers, a bench of Justices Adarsh K Goel and Uday U Lalit recalled number of judgments passed by the top court in the past wherein appeals had been made to the lawyers to come to the aid of needy litigants. “While considering the mounting cost of litigation, it was observed that fee charged by some senior advocates are astronomical in character. The corporate sector is willing to retain talent at a high cost. It develops into a culture and it permeates down below,” said the bench citing a report by the Law Commission in 1988. The Court underlined that lawyers must remember their duty under Article 39A of the Constitution that provides for ensuring equal opportunity for access to justice to all. Backing the Law Commission’s view, the bench noted that the Commission had in fact observed that it was the duty of the Parliament to prescribe fee for services rendered by members of the legal profession. “First step should be taken to prescribe floor and ceiling in fees…Mandate for the Bench and the bar is to provide speedy and inexpensive justice to the victim of justice and to protect their rights. The legal system must continue to serve the victims of injustice,” held the Court. The bench regretted that although the 131st Law Commission report was submitted in 1988, no effective law appears to have enacted to regularize the fee or for providing the public sector services to utmost seedy litigants without any fee or at standardized fee. 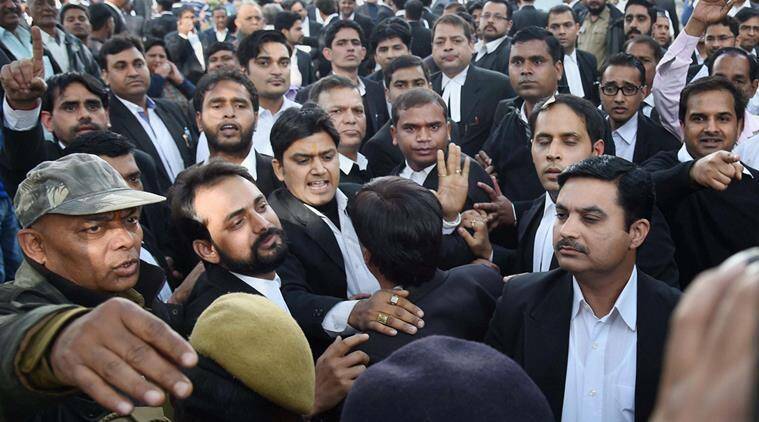 It further pointed out that on the asking of the Supreme Court, the Law Commission conducted another study and suggested for a regulatory framework for the lawyers in India, not only to lay down a revised mechanism to deal with situations of unwarranted strikes and misdemanour but also in other areas. The bench, however, rued that deficiency in the working of the present regulatory mechanism has not been removed by parliamentary intervention. “We hope that the concerned authorities in the Government will take cognizance of the issue of introducing requisite legislative changes for an effective regulatory mechanism to check violation of professional ethics and also to ensure access to legal services which is major component of access to justice mandated under Article 39A of the Constitution,” it noted. The Court was hearing an appeal by a woman, who claimed she was compelled to sign a cheque of Rs 10 lakh by a lawyer although she had already paid the fee as demanded. The bench observed a serious misconduct on the part of the lawyer, who wanted the money on the ground his share was 16 per cent of the total compensation received by the woman in a motor accident case. After the cheque was dishonoured, the lawyer initiated a cheque bounce case against her and she came to the apex court for quashing it. The Court said that fees conditional on the success of a case has been repeatedly condemned as unworthy of the legal profession because if an advocate has interest in success of litigation, he may tend to depart from ethics. “The claim of the respondent advocate being against public policy and being an act of professional misconduct, proceedings in the complaint filed by him have to be held to be abuse of the process of law and have to be quashed,” held the bench in its final order.